My exhibition opening last night was a success! An overwhelming amount of people were there which prompted me to get really nervous and talk AT people in a high pitched overly excited voice for the whole night, basically repeating "THANKS FOR COMING" a thousand times... that's pretty standard behaviour for me at openings of my own because it is actually quite nerve inducing! The opening was so busy that they ran out of beer, and my friends were enlisted to go to the bottle shop and buy some more cases! Insane! Afterwards was the most fun though, my friends and I went out for dinner at Japanese restaurant Yamatos on Exhibition Street, that we have so affectionately nicknamed 'Freaky Yamatos'. It's great in there because it's this huge restaurant that no-one goes to, so we can be really loud and ridiculous and the food is actually delicious and you can sit on those tables where you take your shoes off and sit on cushions. There was about 20 of us, and I had the best fun. We made like three nonsensical toasts raising our glasses to nothing in particular and I felt so happy being around all my friends who always display neverending support when it comes to other friend's artistic endeavours. As usual I am so inept at getting photographs at any important events in my life, (I'm good at getting them at unimportant events) no camera at Graduation, nor last night - but one single photo has surfaced of me and my Nanna, who ever so kindly braved the sleet and rain and cold and the stairs up to Kings, and the back alley to DUDSPACE, to see my show. SO LOVELY! I will document the show properly soon, and put the photos up here. In the meantime you should check it out! It will be open until August 18th from Wednesday to Saturday, 12-5. 171 Kings Street, Melbourne. To the opening I wore a salmon pink Kinki Gerlinki dress that I got on sale the other week. It is sort of backless, which I just love, and sort of sits on the shoulders 'just so'... I dunno, I love it. And it's so shiny. And has huge pockets which my friend's were saying I could even fit a six-pack in! So useful. Anyway I am getting to some sort of end here sort of. I slept really well last night but you know those sleeps when you're awake but asleep, you sort of know what's going on or something and this is going to sound weird, but I had this overwhelming feeling of the colour green. Like, everything felt green. This has never actually happened to me before and it was amazing. Everything was tainted with this idea of green. It was probably some sort of weird awake dream, but I just loved it. I think I want to make a work about it soon. The funny thing about having a show is that despite all the work you've just done, after the opening the only thing I can think about is doing more you know? I'm just busting to get back into the studio. Thanks for being patient with my latest posts - we will now resume to normal broadcasting. 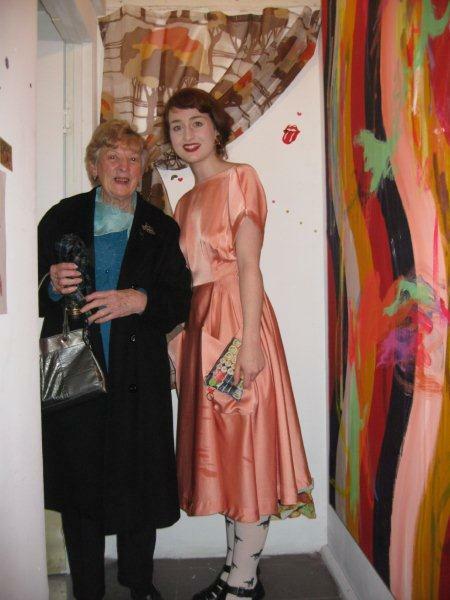 My Nanna and I at my show! Post opening I treated myself to a new shirt. My mushroom shirt! Found this 1957 magazine at an Op Shop this morning. It's in perfect condition. I love the slogan "Lilliput is a man's magazine"
I think I'm going to work up some energy to go to a 'Moustache Party' tonight. Wish me luck. Congratulations! your work is so beautiful, I wish I could have been there - although I did see some at Strange Magic in LA :) your dress/tights/shoes are also lovely! congrats on the art show! how utterly lovely! that photo of you and your nanna is so sweet. also your mushroom shirt is so beautiful.